Is an advocacy group that seeks better cycle provision on the Island. We will cooperate with any organisation or individual that wishes to work towards that goal. The group participates in ways to encourage more people of all ages to learn of the joys and benefits of cycling. Minutes of the Committee meeting [Oct 18] can be viewed HERE.. This has been one of our campaigns over the last few years. It has received much more prominence of late, with awareness activities being done on the mainland as well as our and Spyvelo’s banners. The horse community has a nationwide campaign called Pass Wide and Slow (PWAS) Nationally there is to be an event on 14th April and the local organizers have contacted CW with the details of what is being done on the Island. They are keen for cyclists to join them in what is a common problem. About 100 riders so far, from the Island, have put their names down to take part in the PWAS rides. Rides are being scheduled for Havenstreet to Newport, Ryde Town Centre, Wroxall to Ventnor; Porchfield, Godshill & Freshwater. Processions will leave their start points at 11am and can be joined or left at safe junctions along the way. The Medina Greenway was very badly damaged by the Festival promoters using motorised buggies. A CW member provided photographic evidence which we sent to Rights of Way. They contacted the promoters and we are led to believe that all of the path will be reinstated back to its original condition. CycleWight was awarded a grant from the Awards for All, part of the Lottery, to do a permeability study of Newport. It was intended to be a means of looking at ways to make Newport more walking and cycling friendly. CW hoped that it would lead to working with IWC and Newport Parish Council to implement the recommendations. It was very much aimed at doing things that would be simple and relatively easy to implement. The report was published in February and has been downloaded over 120 times from our web site. A presentation about it was made at the “Newport Travel Forum” on Saturday 20th Jan. During May members of the CW committee are doing a formal presentation to Newport Town council. Some of the ideas suggested would be contra flow cycle lanes in Crocker Street and Trafalgar Road, raised platforms at junctions so as to slow cars, 20mph zones in all residential areas and to create a joint use path alongside Medina Way. Newport Parish Council has commissioned a town audit in the last few months. It sets out a series of actions that could be taken to make it easier to walk around Newport as well as it make it look more pleasing. This in tandem with our report should provide a powerful set of documents to set out plans for a better Newport. We also sent a copy of the study to all of the other town and parish councils on the Island. This has led to Whippingham and Wootton Parish Council commissioning their own permeability study. CycleWight have also been invited to make a presentation to Cowes Town Council in June. Interestingly Cowes has the highest number of people commuting on the Island so it would appear a great place to make further improvements. Far too often the cry is heard, “It can’t be done” It could be, as one only has to go and visit places elsewhere. These items are becoming more common in places across the UK. They are ideal for areas where the housing does not have an easy place to keep a bike eg flats, terraced houses, houses with little storage. CYCLEWight is affiliated to Cycling UK. They provide us with advice, insurance as well as being one of the leading campaign bodies in the Country. You can join Cycling Uk for a reduced fee of £25 by being a member of CycleWight. You will not receive their magazine or some of the other benefits by being a full member but it will include you having third party insurance. If you are interested please contact us through the web site. The public consultation for the new planning strategy has now closed. CycleWight submitted a seven page document, which covered a series of general issues as well as specific points. We were very disappointed that appeared to be an acceptance in the increase of car use. It set no target to increase use of cycling or ways of limiting car use. In our submission we emphasised that high quality design standards are needed if we are to encourage people to cycle. In many places in Europe where the topography and weather are similar to the UK 15/20% of utility transport is done by bike. The next step in the process is for the submissions to be reviewed and changes to the draft strategy made. It will then be submitted to government, where it will be examined independently by a planning inspector. If successful, the Island Plan will be adopted as a major planning document that all future Island development will be guided by. As many of you are aware the boardwalk is now open ahead of schedule. The boardwalk itself has been replaced with wire gabion baskets filled with lightweight materials. This should allow water to filter through and subsidence will be less likely to happen, than if larger stones were used. The original timbers were prone to rotting because of the wet nature of the soil in that area. The path leading to the boardwalk has been resurfaced and widened. This is to allow horse riders to use the path as well. A summary of 2018 CW activities. City Infinity was the company CW used for their evaluation of the St Mary's junction works. We did invite them to the AGM but a representative was unable to make it, Gary Philpotts, from the company, did though make a short video of what is possible with a clear vision of what is needed plus political support. Any thoughts or comments would be most welcome. There was a meeting in Niton last week organised by Councillor Stewart, at which he announced that he would be asking IWC's Cabinet for a further £200,000 for survey work on the Undercliff road. The aim of this would be to do the work necessary to reopen the road to through traffic, at an estimated cost of £2 million ( his figure). We totally understand the depth of feeling around this issue, but feel that the re-opening of the road would do very little to solve the traffic problems of Niton and Whitwell. In fact, taking a wider view, it would be contributing to the idea that the Island is a nice place to drive around. This walking, horse riding and cycling route between Niton and Ventnor is a precious part of the Island's " Green Capital", and should be valued and promoted as such- we should be encouraging our visitors to leave their cars behind, and explore the Island on foot or bike. The Police have responded to the many bikes that have been stolen over the last few week on the Island. Cyclists can help themselves by registering their bikes and keeping a detailed description of each one. (Everyone has at least three!) You can download a form here which will help you to do this. Island groups were invited by Isle of Wight Council to bid for grants of up to £10,000 for projects to boost ‘sustainable transport’. Our application entitled ‘More Paths for All’ was successful. It builds on our work from the Cycle Strategy and our Cycling Permeability Study of Newport. We are now two months in to the project. We are working with a Community Interest Company, called People Powered, which is doing much of the collation of the work and the data input. Ten members of CW volunteered to be surveyors and walk the 51 sections. We have completed 17 and another 20 are under way. It is hoped to finish the physical work by the end of January so as to then have two months to collate the information and write the report. The grant will give us the means to be able to identify paths on the Island which are strategically important for walkers, cyclists and horse riders. From this we hope to look at ways to be able to obtain funds to bring them into wider use. We will be working with the Rights of Way team as part of our work. It is pleasing to report that Island Roads have been in contact with us over the closure of the cycle network because of bridge works and to ask us for our views. The track between Horringford and Langbridge is to have long term works in November and October to mend a bridge. IR though is to keep the track open with a temporary bridge as they have done before at Yarmouth. Great stuff. Our Cycle Strategy has now been published for a year. Since its launch it has been downloaded over 700 times; over 100 the day after the CP mentioned it. It is hoped that this will become an important document in establishing proper provision for cycling across the Island. 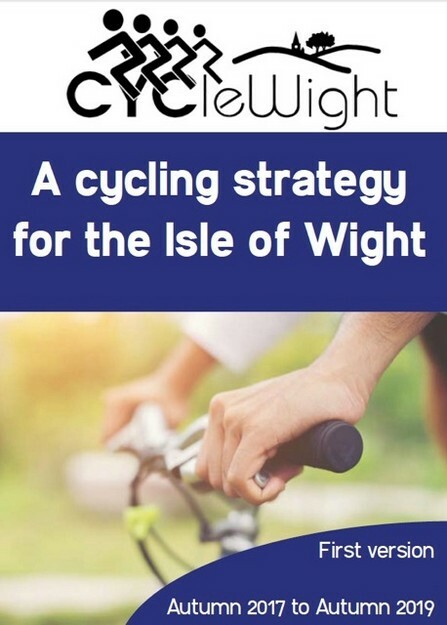 It sets out a series of principles that would make cycling better with a series of maps of strategic routes, which would bring the Island together. It is hoped to update it in 2019 when we hope to be able to cost some of the work we are proposing. We have distributed it to a wide range of people and institutions. It has been well received and we are particularly pleased the Council will be referring to it in the upcoming Island Plan, which goes out for public consultation in December. They also have it on their official web site. It can still be downloaded from our web site. Paper copies are available for a charge of £2 including postage. Follow this link to pictures of some of the different projects delivered via the LSTF and Bicycle Island grants. write to your local MP!